We’ve been keeping a log recently of the questions we get asked on a regular basis. 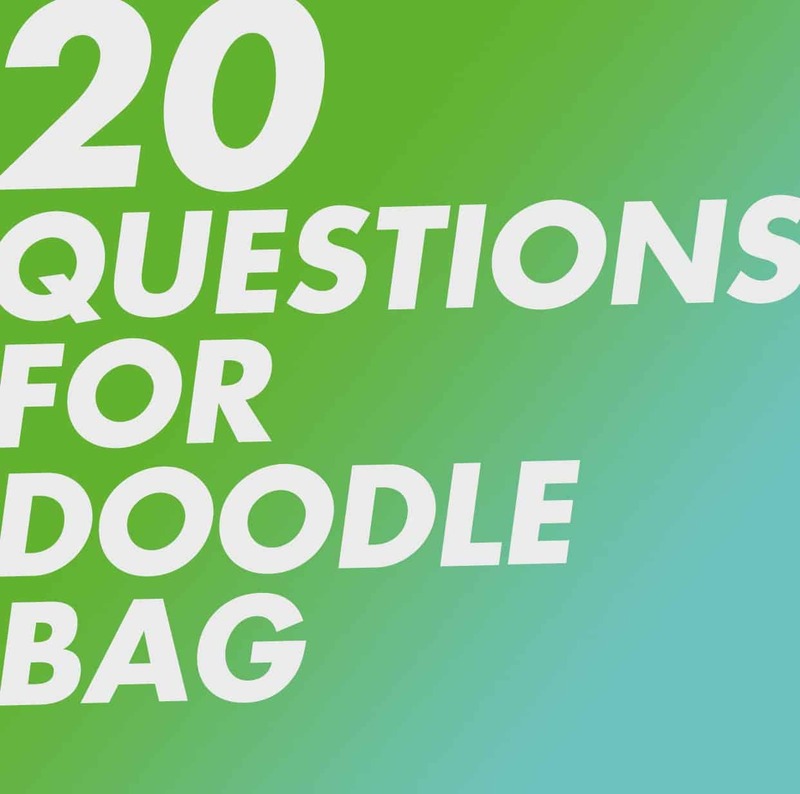 To help you on your way to Doodling supremecy, here’s our list of the 20 most frequently asked questions we get at Doodle Bag. If it’s not answered here, don’t worry, you can get in touch with us and ask your question directly. Yes, we deliver to just about anywhere in the world. Upon completing your order enter your shipping country and postal/zip code, and you will be live quoted for shipping to your area. Some areas will have multiple courier options available. Lead times can vary depending on your location. For instance, most of Europe can be delivered to within 3-4 days, whereas the rest of the world can take up to 2 weeks. International customers get integrating tracking, meaning you can view the status if your shipment directly from our website. 2.Can I upload my own image/design? Yes, you can upload any image from your smartphone, computer or tablet into our product designer. You can also login directly to your Facebook or Instagram account and import pictures. You can add as many images as you like, and adjust their placement on the product. We accept jpg, png, and svg formats. Please note any white within the design or white background will not printed on the final product. 3. Can I use a trademarked logo/copyright material? We don’t recommend this as companies will not like you using their branding for your own product. It is illegal and you are responsible for what you choose to put on the bag. Ask permission first before using someone else’s work. 4. What do you do with my data? We don’t share your data with anyone, at all. Your sensitive payment information is stored with the chosen payment merchant, e.g Paypal/Stripe, and your account details are stored on our secured server. We will not sell or share your data with anyone and understand the importance of privacy. 5. Can I order multiple designs? Yes you can. Just add your first design to your basket, then create another. You can then check out all your products at once when your finished. Remember that design variations are treated as seperate products, and are therefore excluded from our bulk discounts. 6. What if I want a lot of bags? No problem, we can print as many as you like. Our bulk discounts offer substantial savings for bigger purchases, so check out the price list on each product page. Bulk discounts are automatically subtracted from your order total when you add them to the basket. If you would like to order over 200 pieces you can also try our parent company BIDBI, who can offer screen printing and a wider variety of products and finishes for larger orders. 7. What’s the MOQ? I only want 1 bag, is this possible? Yes, you can order as little as 1 bag, with free delivery! This covers all items, whether printed or blank. We want everyone to be able to order as many or as few as they like. 8. Are your bags Fairtrade? Our core range of cotton bags are all Fairtrade made, which means the labour used to create the bags has the certification, however the cotton itself is not Fairtrade. If you would like bags made from Fairtrade Cotton, we also have a range that are not only Fairtrade Cotton, but also organic cotton. This special range of bags are the most sustainable and environmentally tote bags available, and are suitable for those who are extra conscious of their impact on the planet. 9. Can you design my bag for me? We don’t offer an in-house design service due to the small scale nature of most of our orders. However it is super easy to use our design tool, and we have a library jam packed with images that you can use on our products. From gorgeous illustrations, to simple vector icons, there’s so many categories to choose from. 10. I’m a registered charity, can I have a discount? Yes you can! Before placing your order, get in touch with us and include your registered charity number in your enquiry. We will then issue you with an exclusive discount voucher code to be used with your order. We love working with local and national organisations, and if you are running a campaign that involves tote bags, we would love to hear from you. 11. Do you work with large companies? Yes, we work with companies both large and small here at Doodle Bag. We cater for anyone that wants tote bags! 12. Can I buy unprinted bags? Absoloutly. Our entire range is also available to be bought blank. You can buy just 1 blank bag if you like; or hundreds if you need them for an event or for retail. If you’re using the bags for a special project, we would love to hear from you and share it on our social media pages. 13. How many colours can you print? We can print full colour here at Doodle Bag, so there is no restrictions of the number of colours we can print. Note however that we do not have the ability to print white, so any white areas of the design (including backgrounds) will be omitted from your printed product. 14. Do you do next day/timed delivery? Yes, we can deliver next day to UK addresses, with pre-12 options also available. International deliveries typically take a few more days to arrive and do not have the same timed options. Use our online quote calculator when checking out to see how to much it will cost to deliver to your area. 15. Can you do gift wrap? Yes, gift wrap is an additional service that is available for orders for just £2.99. Our lovely gift wrap options include a modern pattern with a bow, or vintage kraft paper tied with twine. Gift wrap options are located on each product page, so be sure to choose the option before you add the product to your basket. You can also add a special note that we will hand write and attach with a gift tag. 16. Can you send under plain cover? Yes we can, just add this to the “Order Notes” box just before placing your order and we will be glad to oblige. 17. Do you work with bloggers/influencers? We love to work with people that are passionate about sustainability/fashion. If you are in the industry and have an idea of a collaboration, get in touch with us. 18. How quickly can I get my bags? Our free delivery option means that your order is dispatched within 1 working day, and delivered within a further 3 days by Royal Mail second class. If you need them next day, select one of our paid courier options and we can deliver next working day to the UK. International deliveries take longer, so allow some extra time, particularly if you’re in a rural area. 19. Can I have whatever I want on the bag? Yes, our design tool allows you to upload absoloutely anything to our products. We reserve the right to cancel and refund any orders with designs that include offensive material. Our Cotton Tote Bag is our bestseller due to it’s low cost and versatility. It is made from premium 5oz cotton and comes in either natural or white. In second place, the canvas shopper bag is a heavier weight version of the standard tote and has a bottom gusset. We also have this in natural or white. Got a question of your own? Get in touch.